So here Shaka Smart sits in Year 4 with one last-place Big 12 finish on his Texas resume, a distressing 55-53 record and not a single NCAA Tournament victory, searching for answers and a jump shot. All but two of the Longhorns who played in the loss to VCU were Top 100 players. "They should be distraught," Smart said. "They should be downright pissed off." The fresh basketball schedule reveals it was just Texas’ eighth game of a season that has barely inched its way into December. A meaningless, mid-week, non-conference game, at that. Except none of them are meaningless anymore. And the pained expressions and the dour, frozen looks on the faces of the players and the deep, almost soulful anguish with which their coach spoke after Wednesday night’s 54-53 loss to Virginia Commonwealth suggested that. 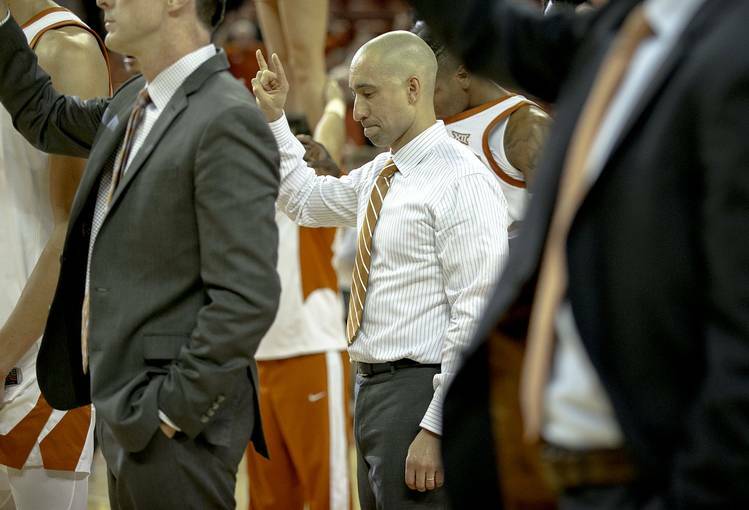 Shaka Smart’s program has reached a crossroads. A big one. If that sounds a bit extreme when his team sits at a decent 5-3 with an impressive Top 10 win in its pocket, you must not have watched the ugly 54-53 loss to his former employer at VCU that included 17 offensive rebounds by the visitors and 18 costly turnovers by Texas. Not to mention zero treys in the second half and two bad misses by totally open Courtney Ramey and Matt Coleman III down the stretch that could have won the game. You should know that Smart has never sounded lower than he did in his post-game press conference. He’s soft-spoken by nature, but he looks troubled. This was somber, worried, maybe even exasperated Shaka Smart. So here Coach Fitty-Five sits in Year 4 with one last-place Big 12 finish on his Texas résumé, a distressing 55-53 record and not a single NCAA Tournament victory, searching for answers, combing his roster for someone who can fill up a basket, and wondering why it isn’t working as it did in Richmond where he went to a Final Freakin’ Four. After back-to-back home losses to respectable but still mid-major teams Radford and VCU, everyone’s wondering why the coveted coach that everybody from UCLA to Indiana wanted isn’t getting it done. Hell, Shaka’s wondering. Apparently he needs to show up at 8:30. So how does a team go from a statement win over North Carolina in Las Vegas to questions about its worth in a span of two weeks. From Thanksgiving triumph to How the Grinch Stole December. Smart’s Longhorns can either follow the disturbing trend that is three consecutive losses on the heels of perhaps Smart’s biggest Texas win. Or they can right themselves, show the world they can hit a big shot or two, play with more smarts and grit and grow as a team into a Big 12 contender once league play begins in 28 days. Contender? Let’s settle for decent. Texas has four games left before conference play. Four meaningful games. Something’s clearly wrong, if not broken. Either in team-bonding philosophy for an introspective coach deeply entrenched in the connective stuff. Or in simple schemes for an offense that can turn invisible and go interminable stretches without a basket, all the while insisting upon launching threes (although they worked the ball inside much better Wednesday). Or in the lack of any strong offensive identity with no easy buckets or clearly defined roles or off-ball screens to free players. Or maybe in recruiting. They can’t all be lottery picks. That said, every Longhorn who got on the floor Wednesday night, save for transfers Dylan Osetkowski and Elijah Mitrou-Long, were top-100 recruits. So somebody thought they were good players. Now it’s time they play like it. Fans are tired of excuses. Texas can’t keep waiting for the next big thing to save it. Jarrett Allen couldn’t. Mo Bamba couldn’t. Your turn next, Will Baker. The truly great ones don’t need a coach to instill that in them. Maybe this is just who they are, which Smart said “is a fair question.” But this is not a team blessed with skill, with shooters, with a point guard who can dictate a game. Maybe they got too complacent or too big-headed after they downed the Tar Heels and were competitive against Michigan State. Gone is that sense of urgency, the grind-ability that this team must rely on to win. Or maybe they’re just not that good. For sure, the Longhorns are all mad. So are a lot of people. And a bit confused. The players were clearly distraught. It’s maddening, of course, to watch the cerebral, caring Smart agonize over a team that sank just four of its 17 threes and nary a one after intermission, including the final try for the win from Coleman at the top of the key. It’s perplexing how a team can make turnover after turnover down the stretch against a VCU system that Shaka created. It’s bizarre that Roach can shine on the biggest stage against a North Carolina with 32 points, then fizzle and make seven of his next 37 shots the next three games. The Big 12 isn’t for the faint-hearted. Only true competitors need apply. Where’s that 1-0 Tom Herman mentality when you need it? Purdue comes to the Erwin Center on Sunday. Because if his team doesn’t develop some momentum, doesn’t hit a few shots, doesn’t start hustling more like rebounds, doesn’t get its more experienced players like Roach, Coleman and Jericho Sims playing and leading better, well, there will be more VCU nights. And more introspection. There’s plenty of distraught to go around.